The objective of the project was to create a distinctive competitive advantage to Data Ireland in the area of “Big Data”. By accessing Business.ie database contacts “on the go”, field sales representatives can bring up detailed company information on their mobile device and respond immediately and locally. A key requirement was that the app would be able to pick up on the user’s location using the device’s location services and provide a list of businesses and contacts in the vicinity. 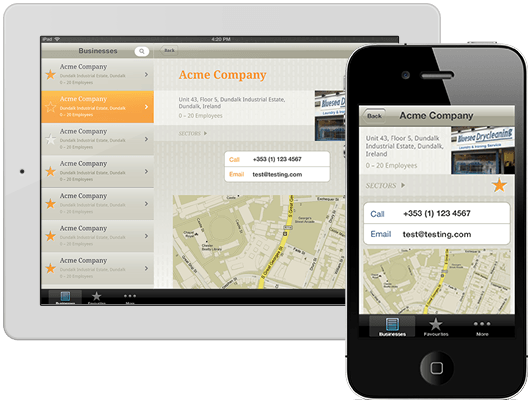 The Lead Locator field sales app for iPad and iPhone was developed for Data Ireland by Púca and was launched in the business apps category of the App Store. Lead Locator was developed by Púca as a “universal” application, so using a single log-in you can access the app seamlessly on both your iPad and iPhone. Lead Locator integrates with the device’s location services to serve up local search results to the user. Following best practice UX (User Experience) design, Púca went through a number of design cycles prior to commencing development, to ensure an optimal user flow. Lead Locator has already been deployed by several enterprise clients such as Topaz, Paypal, Rentokill and An Post. Data Ireland have overcome some of the major challenges in Big Data today, namely the capture, curation, storage, search, sharing and visualization of data. The field sales app has been awarded “Mobile Project of the Year” at the ICT Excellence awards 2013, as well as “Best Tablet App” (bronze) at the Appys, and “Best Mobile App B2B” (Gold) at the Mobile Marketing Awards. We were impressed by the Púca team’s ability to effectively take our concept from design to prototype to finished product in a relatively short timeframe, and we’re very pleased with the results.